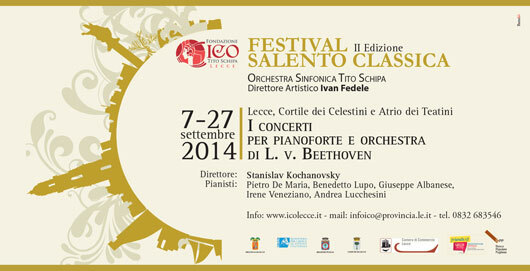 Taking place in the city of Lecce in Salento, Puglia, this series of classical concerts under the direction of brilliant young Russian conductor Stanislav Kochanovsky features five of the best pianists in Italy and the Orchestra Sinfonica Tito Schipa. It is the second edition of the festival and as well as exploring the delights of classical music in an architecturally beautiful setting, it is an important milestone in determining the future of the orchestra, being part of the #savetheorchestra campaign. The campaign aims to bring the orchestra back to a prominent place at the heart of Salento life and culture. .